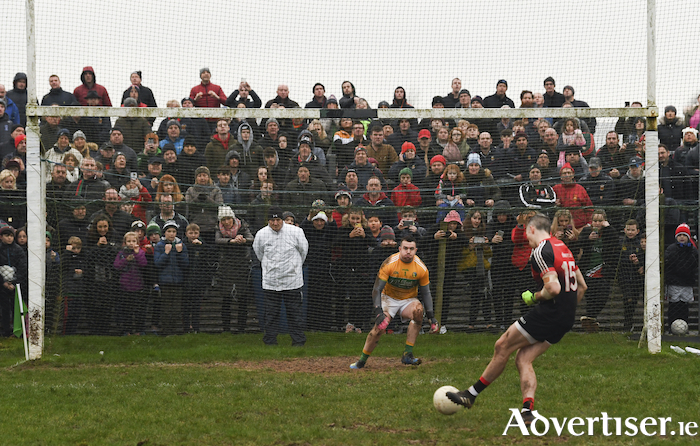 What unfolded in Páirc Seán Mac Diarmada on Sunday afternoon will in time just become a small footnote in Mayo’s history, with the added spice of it being the first time that Mayo ever had to partake in a penalty shootout to decide the outcome of a game. The game going to penalties took almost everyone in the ground by surprise, with most of the healthy early season attendance getting ready to wrap themselves up warm for another 20 minutes of football at least. But penalties it was - the game really shouldn’t have gone to spot kicks though, with Dean McGovern being shown a red card on the town side of the field deep in injury time - but he he somehow managed to stay on the field to play the final pass to Damien Moran who kicked Leitrim’s 13th point to level the contest up at the end of 70 minutes. The news of penalties was greeted with particular glee by the younger fans in attendance who made a beeline to get behind the goal they were taken into, as soon as it was announced over the public address system it was going to be a shoot-out. Mayo held their nerve with Jason Doherty hammering home the first spot kick, Ryan O’Rourke’s effort just scraped under Rob Hennelly in the Mayo goal to level it up at 1-1. Up next was Brian Reape for Mayo and he made no mistake with his effort, unfortunately for the hosts Mark Plunkett’s effort came back of the post with their second penalty. Fergal Boland converted penalty number three for Mayo before Domhnaill Flynn missed his sides third penalty meaning that if Evan Regan converted his effort Mayo would move to the semi-final which he did with ease - sending Mayo into the semi-final against Galway in Tuam next week. As for the actual action on the field, that was a very up and down affair for Mayo - who had a pretty decent first half, before the wheels came off the wagon a bit in the second half. But as with all things at this time of year - there are quite a number of variables to be taken into consideration. That being said - Mayo did start a very experienced defence with three All Star’s in their back six, Lee Keegan, Ger Cafferkey and Brendan Harrison - who was making a welcome return to Mayo colours starting his first game for Mayo since last years league meeting with Kerry back in early February - also in the back six was Eoin O’Donoghue and Donal Vaughan, with Claremorris’ James McCormack - being the only real greenhorn in the unit. Seamie O’Shea and Stephen Coen comprised an experienced and hard working midfield duo, while up front things had a very new look about them. Jason Doherty captained the team from centre-half forward, while Fergal Boland and Evan Regan - neither of who are nailed on starters or even players who will always get game time from the bench in championship contests his most experienced foils in the front six. The Westport duo of Fionn McDonagh and Colm Moran alongside Brian Reape being given the number 14 shirt and a chance to impress - were things that the Mayo supporters were looking forward to seeing. Leitrim who themselves were under new management started the brightest and led 0-3 to 0-1 after just four minutes with Pearce Dolan, Shane Quinn and Jack Heslin all getting points - with Mayo’s response coming from a Jason Doherty free. However the game was just about to take its first major shift in direction - Brian Reape blasted home the first goal of the day after he rounded a defender and two minutes later Fergal Boland arrowed the ball to the back of the net on the run after some good build up play by Mayo. Shane Moran almost hit back with a goal for Leitrim, but his effort crashed back of the post and Heslin pulled the rebound wide of the target off the deck. Hyland’s men did get the next score thanks to a fine effort by Dolan - but Mayo were about to get into a groove and start building up a lead. Regan slotted one over from play, then Hennelly landed a 45’ - that really shouldn’t have been given because Mayo played too many hand passes in the build up, but it wasn’t spotted by the officials - then Colm Moran put six points between the sides with 14 minutes gone - putting Mayo into a 2-4 to 0-4 lead. Cillian McGloin cut the gap back to five points not long after, but Mayo went on to reel off four points on the bounce through efforts from Boland, Regan, O’Donoghue and Reape to go nine points clear at the half hour mark. Leitrim did tag on a few scores before the break to close the gap a bit through scores from Heslin Shane Moran and Sweeney - with Mayo’s last score of the half coming from a Doherty free to send his side in leading 2-9 to 0-8 at the short-whistle. Leitrim could and should have hit the back of the net right from the throw in of the second half when Heslin was played in clean through the heart of the Mayo defence - but his effort was saved by Hennelly and put out for a 45. The home side were reduced to 14 men for ten minutes in the 41st minute when Dean McGovern was black carded for an off the ball incident with Brendan Harrision. Mayo did initially make the advantage count stretching their lead out to eight points when Fionn McDonagh became the sixth Mayo starting forward to get on the scoresheet. But from then on in, it all fell apart for Mayo - Heslin scored the point of the day with his right foot from a tight angle out near the right hand side line on 44 minutes and 60 seconds later the ball was in the back of the Mayo net. Mayo turned the ball over and it was fed to Ryan O’Rourke who had just come on, his effort was blocked by a Mayo defender - but Evan Sweeney was lurking and tucked away the rebound to give his side a lifeline. Two minutes later O'Rourke got his rewards, when once again Mayo turned the ball over and it was worked quickly to Sean McWeeney and Sweeney who found O’Rourke who made no mistake to leave Mayo now just leading by a single point on a score of 2-10 to 2-9. With 16 minutes left the game was all square thanks to a pointed free by Domhnaill Flynn - much to the enjoyment of the home faithful, as what seemed like was going to be a routine victory for Mayo looked like it could become something else entirely. A point from Fergal Boland that was quickly followed by a Doherty free seemed to have calmed the Mayo nerves and put them two clear again, but Leitrim kept coming and Sweeney tagged on a free and Flynn should have hit the back of the net - but his rasping effort came back off the bar. Mayo edged two clear again a minute into injury time when Boland dispatched one from downtown - Leitrim weren’t going to bend the knee that easily though and Sweeney put one between the sides with two minutes of injury time to go and Dean McGovern still had a major part to play in the outcome of this contest. Mayo: R Hennelly (0-1, 1’45 ); E O’Donoghue (0-1 ), G Cafferkey, B Harrison; L Keegan, J McCormack, D Vaughan; S O’Shea, S Coen; F McDonagh (0-1 ), J Doherty (0-3, 3f ), F Boland (1-3 ); C Moran (0-1 ), B Reape (1-1 ), E Regan (0-2, 1f ). Subs: C Crowe for Cafferkey (h-t ), J Kelly for Coen (58 mins ), B Doyle for O’Donoghue (59 mins ), O McLaughlin for Moran (64 mins ), C Tracey for McDonagh (68 mins ). Leitrim: D McKiernan; P Maguire, F McTague, A Flynn; C Reynolds, R Mulvey, S Quinn (0-1 ); D McGovern (0-1 ), S Moran (0-1 ); S McWeeney, C McGloin (0-1 ), J Heslin (0-2 ); E Sweeney (1-3, 2f ), P Dolan (0-2 ), D Flynn (0-1, 1f ). Subs: M Plunkett for A Flynn (39 mins ), R O’Rourke (1-0 ) for McGloin (45 mins ), G Reynolds for Heslin (49 mins ), D Moran (0-1 ) for Dolan (63 mins ), D Rooney for Mulvey (68 mins ). Referee: James Molloy (Galway ).